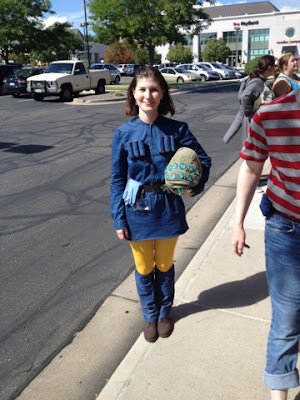 Positively Miscellaneous: NDK 2013: Finishing Touches and the Main Event! 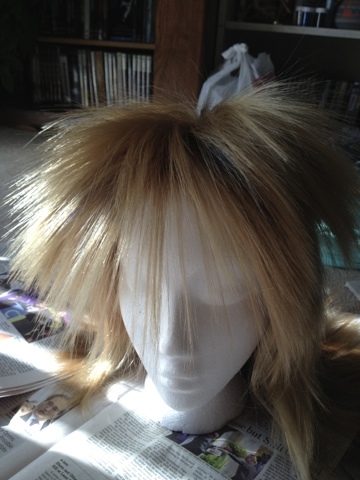 NDK 2013: Finishing Touches and the Main Event! Yesterday was the last day of NDK 2013. Sad faces. This year's program. Pretty, yes? 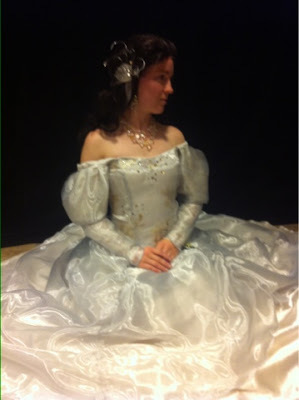 First things first, I had to finish my costumes! 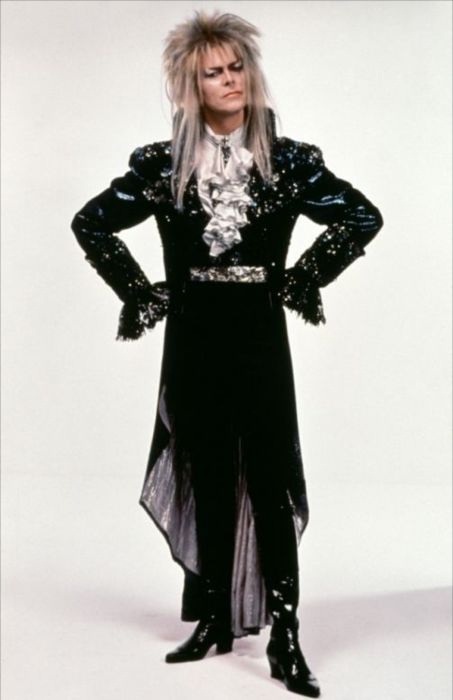 Namely my Jareth costume. My wig! Starting to put in the blue. I used a sharpie. They seem to work fine. Before I put rhinestones on, I sprayed the whole thing with fabric glitter spray (which I actually used on the wig as well). 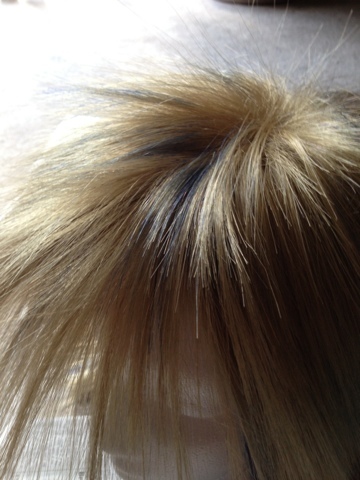 It added a general sparkle. 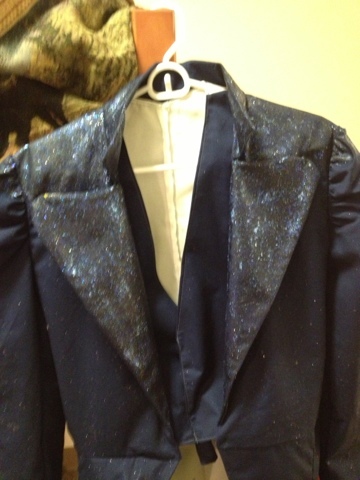 Then I created a paste with mod podge and lots of glitter (like I did for the lace cuffs) and painted it on the lapels, shoulders, and back where the rhinestones go. 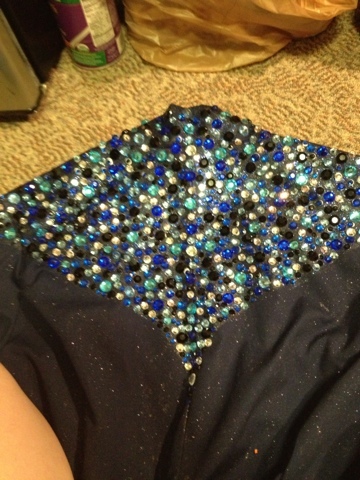 Rhinestoning! (That's a word now). I got tons of blue, black, and silver ones and just rhinestoned (see, it's a verb!) 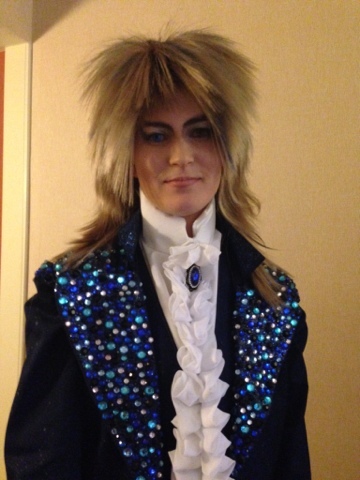 until I achieved a 1980's level of tackiness. It had to look tacky from the front, too. I watched a lot of Sailor Moon during this time. Unfortunately, Colorado had some pretty major flooding the week before NDK. I couldn't get down to Denver on Friday to join in the fun. The roads did open back up so I could make it there on Saturday morning. How it is supposed to look. I think it came out alright! Plus, my good and talented friend, Cat (here is her little company page: Addict Outfitters) made me a plushie Ohmu! I love my Ohmu! This was a fun one. 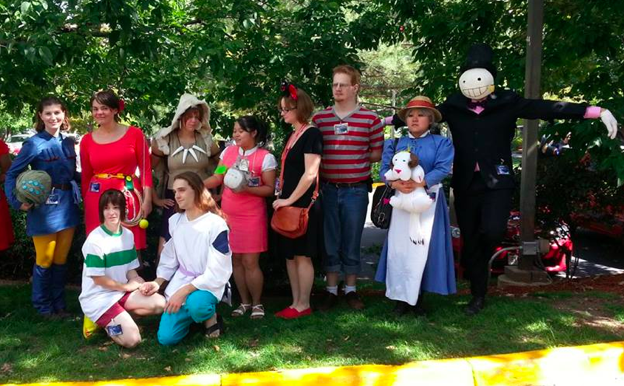 Not everyone really realized that we were there as a group, but people kept noticing that they were running into a lot of Ghibli characters. Saturday was when my friend, Jhenn, held her NDK panels. 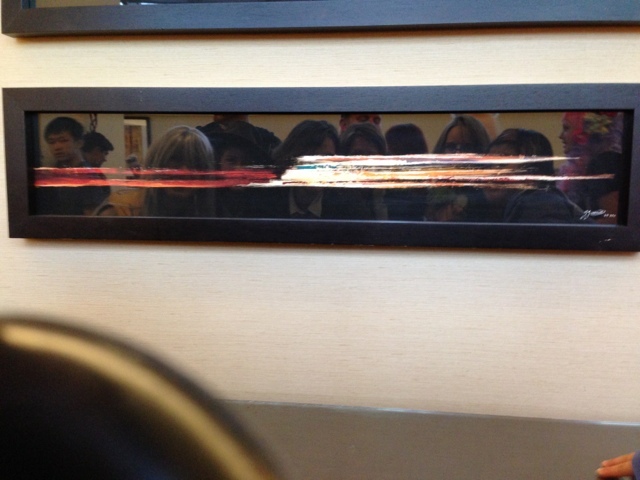 Her first one was on Japanese book binding. I know they were short on time, but she managed to gather a large group of interested people, which was wonderful! It was too full for most of us to sit in on, sadly. 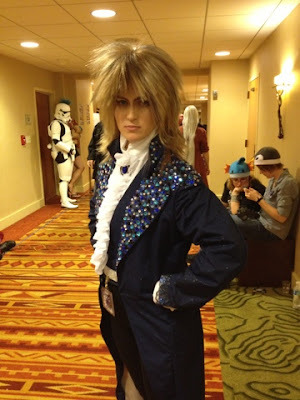 Here is my Jareth costume. There are actually a few floating around on the internet, too. That's cool, right? It's OK, most people won't know that it's me. Trying to glare in a menacing fashion. How it's supposed to look. Not too bad a job, right? I bought colored contacts that were not prescription nor were they fitted to my eyes so they were very uncomfortable! But here they are with my makeup that my friend, Katja, did much of. I also have a decent amount of glitter on my face, which is difficult to see. On Saturday night, Jhenn had her second panel: Ink! This one I managed to sit in on. Which was nice because she sketched a picture of me with my rat babies for an example. It was a good panel and very educational. Jhenn is a good teacher. Go to her panels! Plus, she is a great artist. She had some art pieces up for the art show that they hold every year. Both were beautiful. People bid on both! So proud! Saturday also held many of the main events of the convention. The AMV contest and awards are always highly packed. The costume contest happened this day, as did the "Mask-a-rave." They had so many events going on, it is impossible to keep up with! The best strategy is to pick panels that you want to see and make sure you hit those and do anything else in between. Oh, and for future con goers: get to your panels early! NDK has gained a ton of popularity since I started going. They offer so many things, but it is very crowded and space is limited! And remember, there is always Artist's Alley where artists gather and sell their crafts. 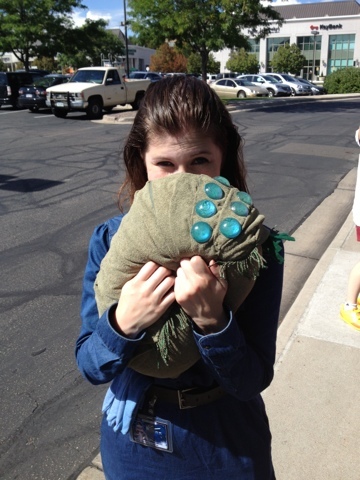 This is a favorite spot for me--people are so creative and talented! I actually bought a couple of beautiful dragon prints from an artist. I highly recommend checking her out: Little Wings Dragons by Carla Morrow. They have two different gaming rooms, one for live games and one for video games, both of which can attract quite the crowd. You may have to wait a while for your turn at the games, but it is fun! They always invite many, many guests who participate in panels, interviews, and autographs. It is always great to connect with the people involved in the anime and manga industries and hear what they have to say. 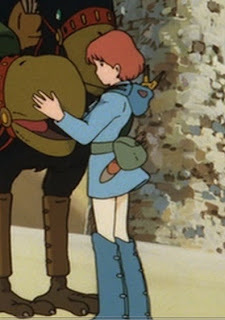 This has always been a base for NDK. They have been very successful and lucky with participation from the greats out there! And last, but certainly not least, is the Dealer's Room. It's a hot spot! The lines to get in are almost always long, but they move fast! My advice though? Watch what you are buying. Some of the venders mark their prices up quite a bit, which I think is unfair. Be aware of what is good pricing and what is oddly high. You can probably find these at a shop for a reasonable price. That's not to say that they are all there to rip you off, that's not true at all. Just be aware. Really though, you can find SOOOO many cool things here! It is crowded, but worth waiting and browsing. 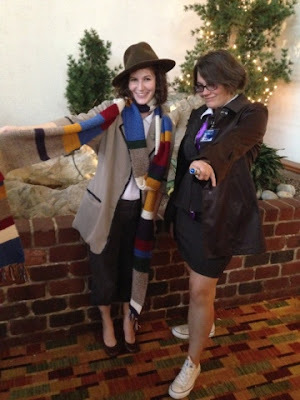 Sunday, Katja and I did our Lady Doctor costumes. I probably shouldn't be smiling... And Katja lent me that hat. The fourth and tenth Lady Doctors! 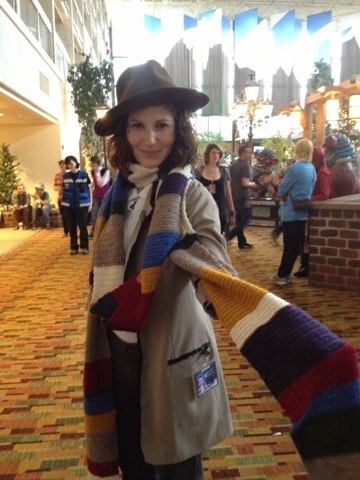 I did get many, many compliments on my scarf! Which made me happy because I love it! It is probably 13 feet long or so. Every year in the past (since NDK has been held at this location, anyway) we have taken a picture of our group in the reflected ceiling windows at night. We actually forgot this year so we used this conveniently dark wall art to take our reflection picture in. You can kind of see us. That's the end of NDK 2013! If I happen to stumble upon anything interesting that relates to this, I will be sure to post it for those who are interested. 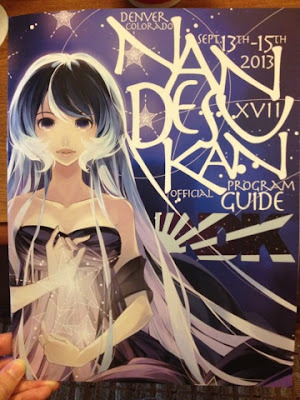 Here is the official NDK website: Nan Desu Kan. Check it out! They are already starting registration for next year! And, yes, they do sell out. Next year, our big group cosplay is going to be a cross between Sailor Moon and Disney heroines. Yes, you heard right. It might sound weird, but it will be fun! Maybe the boys can be Disney heroes crossed with Tuxedo Kamen. Who knows. I don't know what else I will do. There was talk of Power Rangers, so maybe I will be the pink ranger. We will see. But, if you ask me? The best part about NDK is that it is a tradition for me and my friends (apparently we've been going for about 11 (or so?) years, though I know I missed a couple in the middle). We get to see each other and hang out together all weekend. We get dressed up, we eat our meals together, and we just hang out! I always look forward to spending this time with some of my best friends. I love you guys! You are the ones that make NDK fun for me. I look forward to next year! I agree, wholeheartedly. I've outgrown the adolescent fan-girl squealing (except when you escaped from Fort Collins), but it's the tradition of being with friends that makes it special. Next year we will toast NDK from the atrium balconies (for real, this time, no screw ups, Mariott) and rock the sailor outfits. Thank you for all the panel support and love. Your cosplays keep getting more amazing, too. Excited for the next adventure. I think we've all outgrown that phase. But it's still fun for us! I am already excited for next year! With our atrium rooms! I hope you do more panels! You are great at them! What fabric glitter brand did you use? Lovely! Thank you! 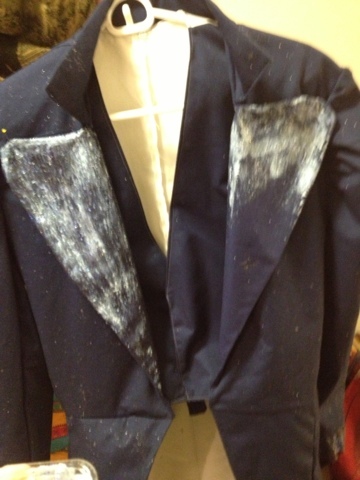 I started by using the Tulip brand glitter spray paint. I used the "Black Diamond." That worked well on the suit and the wig. 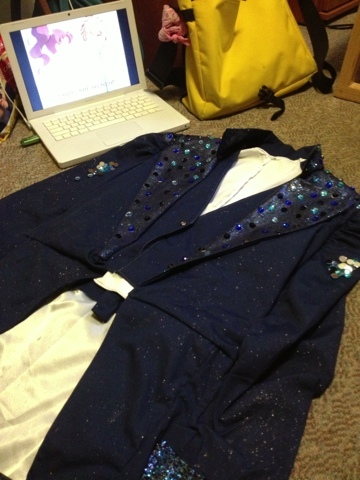 I made a mixture of dry glitters (blue, dark blue, silver) and mod podge to outline where I wanted to rhinestone and painted it right on the fabric.That added a lot of glitter and shine behind the rhinestones.